Business is competitive nowadays and you cannot even think of success if you are not doing something innovative and different as well as useful. The business strategies now follow the road of innovation because technology and globalization have changed a lot of things. The first step toward the success is the hardest one because for the first step, you have to make much more effort compared to next or next to next step. Innovative mind, innovative people and innovative ideas are something that are hardly found. Recruiters do lots of efforts in hiring innovative people. Being an innovator is not that simple as it appears. There is a mindset which explains a certain quality of the post and the person. An innovator is a person who handles all sorts of business incoming and outgoings for the overall development of the business using or implementing innovative measures. Therefore, an innovator needs to be creative and innovative with their business ideas, which is the main and the foremost subject of their job description. There is a saying that innovators are born and not created in the laboratory, or school or college or in the business world, but the reality is innovativeness come from within. Who can understand innovation better than an innovator himself? No one, right? But the fact is there are people out there who are innovative but hardly appreciate innovation. You should worship something which is the key part of your job and success. It is the job of the innovator that he or she should be capable of handling the work of innovation. It is quite obvious that the innovator should appreciate innovation more than anything. Therefore, every innovator is supposed to encourage skill and innovation as per their job description and as a duty being the innovator. Have you ever thought that some of the most amazing innovations had not been invented if the people who invent them feared taking risks? People feared the risk because it means uncertainty which can lead to both failure and success, but the honest risk is the only way you can do something amazing and out of the box. Uniqueness and innovation are something most organizations seek and make lots of efforts to introduce both the element in their workplace. One of the common reasons that almost every employer expects from their employees is that, they should not be afraid of risk taking and work without the fear of failure. Without risk taking nothing can be possible. Therefore, it is necessary to understand that risk-taking is a part of each and every work which involves profits and loss within their business transactions. Being innovative is one thing, but using these innovations in the real life is something most people hesitate because innovation can be easy but the implementation is a team effort. Most of the innovations and creative ideas go to the trash can because the innovator doesn’t have the guts to follow through and feared more than encouragement. It is possible that the innovators bring in all sorts of innovative ideas to their business, but the main drawback that they have is that they cannot continue that without any outside help. Therefore, most of the innovators prefer training others and share their innovative ideas with them for the sake of better implementation. Training ensures that the innovative ideas they have will surely be implemented for better. A positive outlook is something that can change a difficult situation into easier ones because it gives courage and a belief that everything will be fine. Positivity is the important part of being innovators because innovations are born in a positive environment. Being positive is essential for innovators if they truly love innovation and wants to imply them in reality. Most of the work environment requires a positive attitude towards their working structure and style. And that is why getting all sorts of positive approach is something really important for every business outlet. And when it comes to innovators, they compulsorily believe in being positive with work level thinking which involves creativity. Our culture cultivates us and gives us a chance to grow and learn in a healthy fulfill environment. There are people out there who blame culture and all the rules and regulation that came with the culture, but in reality, culture is something that keeps us human and bonded. People think that when it comes to innovation culture can be counted as a last in the list of its credibility. But the most important quality of the innovator is that they value both culture and innovation equally because it is important to balance both in a proper manner. You cannot even imagine innovation without the culture that’s why most of the innovators respect the culture, whether it is in east, west, north or south. One of the major advantages of being an innovator is that the innovators can bring in better productivity value to one’s business where in which they are involved. Moreover, it is one of the major traits of the innovators which makes the rest of the business people make an offer or decision of hiring the innovators in their business growth and development. One of the major confusion about innovators which people keep in their mind that they believe in miracles, which is completely untrue. A great innovator supports innovations rather than miracles. Innovations are nothing compared to magic. It maintains a completely different perspective of thinking. The innovators always support diversity for the sake of growth and development of their own technological and economic reasons. Bringing diversity and being part of it is something that most of the innovators believe in delivering. Therefore, the innovators implement this diverse parts of the organization. There are one thousand things that can be listed as the characteristics of the innovator’s mindset, but we had already covered all the necessary and common traits which are also the characteristics of the innovator’s mind. All the listed characteristics, qualities, and traits are one of the main reasons for imposing a great innovator. Each and every characteristic and trait mentioned in the above-discussed points just explains all the related details about the innovators. Still, there are a few points we would like to share with you to make all the information more relevant and easy to hire someone with an innovative mind. An innovative mindset is a real problem finder and a problem solver. They start work from the middle of a problem and invest all their energy in finding the issue that is creating problems and then starts to find the innovative, effective solution. An innovative mindset is a problem finder and a solver. There is no innovation without taking the risk. An innovative mind never hesitates from taking risks and taking them well so that they can find something innovative, unique to do. They are always curious and their mind hardly rests ever as they always think about the challenge, problems and new innovations. So many ideas and new innovation take place in a healthy conversation or amidst a group of people who have a keen for innovations. An innovative mind works better in a group rather than in isolation, that’s why it is said that you have to share and take before you get the chance to ask a new question or to create new innovations. An innovator’s mind is an observer. There are thousands of things that happen in our life on the regular basis, which we hardly pay any attention to but innovative mind always observes to find new ideas, to learn and to create something extraordinary. There are so many people out there who have an innovative approach but what benefit it is off, if there is no real outcome out of it. An innovative mind is also a creator who creates something out of innovation ideas. The actual job description of the job profile of the innovators belongs to the skill and talent hidden in them and that is there to create something new and innovative. And these innovators are basically entitled to receive an annual salary of 1.34 to 1.6. There are several different parameters that are to be verified before coming to a conclusion about the innovator’s salary. Every session involved within the interview process requires a certain level of credibility of handling such pressure and confidence. And while hiring an innovator, an employer need to be aware of all the below-mentioned questions ready, so that the employer can hire a skilled innovator for the job. 1. If you have been given a limited budget to create or start a business, then what kind of business would you choose? With this type of question, an employer is even trying to understand the credibility of the candidate when it comes to understanding the limited area of work and budget. If the candidate is smart enough to handle such strategic question, then he is definitely going to be hired as a next innovator in the business. 2. If you get to meet the CEO of the company, then how would you convince him to change his mind about this business? This kind of provocative questions creates some sort of controversy between the manager and the interviewer or the employees as well. Therefore, while answering such question, a candidate need to plan his answer perfectly before pitching his ideas in the form of his answer. 3. How do you handle a crisis situation? With the help of this question, a candidate might be getting his exposure in the area of their expertise. Therefore, while answering these types of creative problem-solving questions, a person needs to rethink everything because his answer needs to fulfill the criteria of creative decision making. 4. How did you react when you failed at something important? It is treated as one of the resilience related questions, with the help of this question the candidate might understand the personality traits of the candidate which can help the company or the business in the long run. Therefore, it is necessary to handle such questions in such creative manner that the end results of the interview should get the candidate some positive results. Finally, the bottom line is that at the end of this discussion over interview questions to help in hiring a next innovator can definitely provide a better understanding about the innovators. 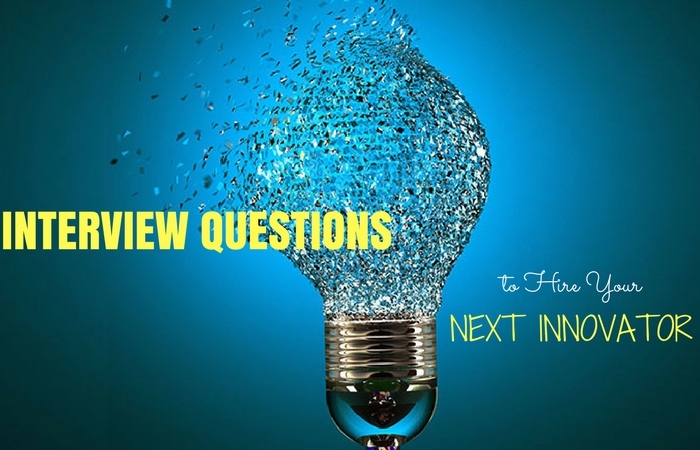 Therefore, those who are trying to get into a company as an innovator, they should take a look at this discussion and follow all the mentioned details above to be sure of everything related to the innovator interview questions.